A giant sinkhole that emerged on the site of a collapsing mine in western Russia has been getting steadily bigger, threatening nearby village houses and the forest. 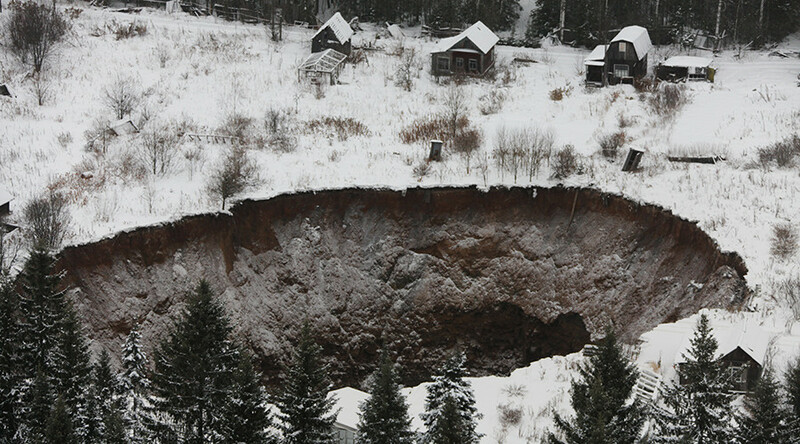 Resembling a meteorite crater at first glance, the sinkhole in the Russian region of Perm has been expanding ever since it appeared, according to photo evidence, recently reported by locals on social media. The abyss near the town of Solikamsk dates back to last November, when its surface dimensions were some 20-by-30 meters. In nine months’ time, by the end of August, the crater has reached a stunning 122-by 125-meters wide, The Siberian Times reported on Wednesday. The sinkhole shows no sign of a slowing appetite, as the collapsing soil keeps sucking up nearby houses. It is estimated to be about 75 meters deep, and can already be seen from space. It lies in the neighborhood of the Solikamsk-2 mine, which suffered from underground flooding last November, the time when the sinkhole emerged. The mine is owned by the world's number one potash producer, Uralkali. The company, however, blamed a flooding in 1995 that was caused by an earthquake, and promised the owners of the collapsed houses some form of compensation. In the meantime, they are also suspending the operations on the potash mine. The crater’s origin is different from the natural phenomenon that is behind the craters in northern regions of Siberia, which have recently stunned scientists. Craters in permafrost regions are linked to the process of melting of soil that has gas hydrates, which leads to underground explosions.